A congested Brazilian highway. Photo by Paulo Fehlauer. President of Brazil Dilma Roussef announced nearly $69 billion in transportation infrastructure investment over the next two years. 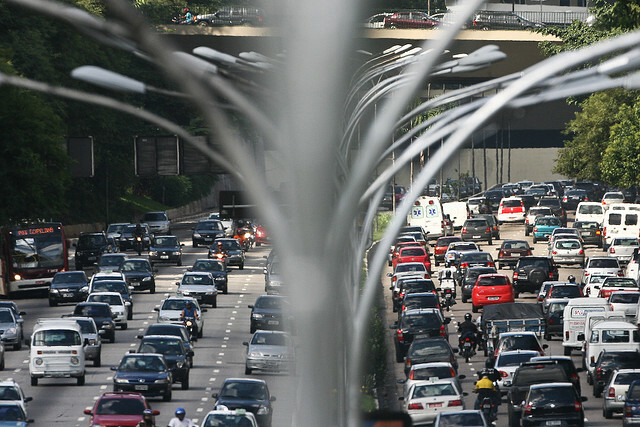 Brazil, which will host both the 2014 World Cup and 2016 Summer Olympics, has incorporated sustainable transport into its development plans, with some technical support from EMBARQ, the producer of this blog. Google Maps, the wayfinding web application, surpassed more than 1 million public transit stops from Sydney to London. Those using a mobile operating system other than Google-designed Android OS have access to less than 1 million stops. IBM will launch its 12th research lab in Nairobi, the first of its kind in Africa, with aims to increase government and services capacity through information technology. The lab will offer an “integrated command center” for Kenya, which could serve as a model for streamlining transportation networks in Nairobi and other cities across the continent. Only 30 percent of Israelis use public transit, among the lowest ridership averages in the world. This data, sourced from a state issued report, also noted that net savings from increased transit use could be up to $100 million. New York City’s much-anticipated Citi Bikeshare program, originally slated to launch in July, is set to roll out eight months behind schedule, next March. When the system is finally open for use, 7,000 bikes at 420 stations will be available across the boroughs of Manhattan and Brooklyn. The carmaker Nissan will increase domestic production in the United States by 18 percent, fueling a boom in auto manufacturing. Nissan, based in Japan, is being incentivized to invest by untapped markets in the Americas and a prohibitively expensive Japanese Yen, which makes exports more costly to global consumers. The move will add hundreds of thousands of private vehicles to both North and South American roads. In keeping with global best practices for bus operations, San Francisco’s “first-in-the-nation” all-door boarding policy has markedly decreased wait times along its five most congested routes in its inaugural month. Across town, the hidden costs of underbidding for San Francisco’s subway extension may end up costing the city 40 percent more, or $765 million, to complete an underground line to its Chinatown neighborhood. The Los Angeles City Council is altering the way businesses are required to provide parking, in line with the Mayor’s efforts to create “elegant density” as the city develops its bus and rail corridors. The Council is working to reduce minimum parking requirements, which could add costs and land use burdens for businesses and the urban environment. Rail fares are set to go up for English rail passengers, increasing 6.2 percent by January. Some passengers will end up paying nearly £1,000 (US$1,567) more per year for their commutes. There is a tangible link between air pollution and stability, according to a recent study in the American Journal of Epidemiology. High levels of common airborne pollutants associated with common factory and transportation-related emissions increases chances of delivering a stillborn baby by 27 percent for every 10 parts per billion increase in exposure to nitrogen dioxide over the course of a pregnancy. A federal court in the U.S. State of Texas struck down a federal mandate capping certain levels of pollution from Texas factories. American companies are “cashing in” on China’s notorious air pollution by providing emissions filters for trains and buses to reduce nitrogen dioxide emissions. An overcrowded bus carrying passengers 385 miles north of New Delhi crashed, killing 52 people. The bus, which fell into a ravine in Himachal Pradesh state, was over capacity, carrying some passengers on its roof as it descended the gorge. Politicians in the U.S. State of New Jersey, which has one of the highest driving age requirements in America, are mulling legislation that would restrict the number of same-age passengers that may accompany teenage drivers. AT&T launched an advertising campaign, ItCanWait.com, calling for mobile phone owners to refrain from using their phone while behind the wheel. Meanwhile, New Jersey’s Ocean County is introducing a mobile phone app that disables texting while a vehicle is in motion.